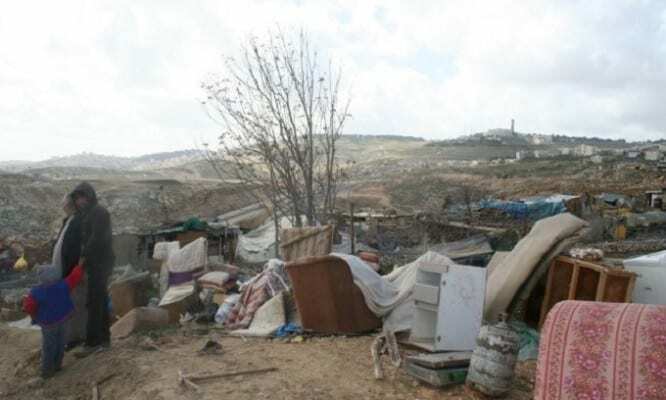 The decision comes after Israel’s Channel 2 revealed that the EU had distributed a number of mobile structures in the E1 area of East Jerusalem in addition to areas in Essawiyeh. The Israeli civil administration has said it would not allow any illegal structures in these territories, including those distributed by the EU. One EU source said in response to Netanyahu’s decision that: “The structures were distributed because of the Palestinians’ urgent need for them.” The source added that the EU was opposed to any settlement construction in the West Bank, including the E1 area in east Jerusalem. The EU is building hundreds of illegal structures in the West Bank, which the government has not removed in order to avoid a diplomatic tangle with the Europeans, according to a report released Friday by the NGO, Regavim. The structures are being built near Ma’aleh Adumim and its E1 area. This report is just one of a number the group – a right-wing organization which describes itself as a “research-backed, legal advocacy organization focused on land ownership issues” – has released in recent months. Regavim claims EU support for these structures is part of a Palestinian plan to gradually take control of large parts of Area C, the 60 percent of the West Bank that, according to the Oslo Accords, is under full Israeli control. The underlying idea behind the joint Palestinian/EU efforts in Area C, Briggs asserted, is to establish a permanent Palestinian presence on the state lands there. “This is great hypocrisy,” Briggs said. “Any time a building goes up for Jews, they raise an outcry, call it illegal and say it endangers peace. They are building illegal houses for Arabs.” From 2012-2014, according to Deutsch, the EU – at the cost of millions of euros – has put up more than 400 structures.